The Punjab State Electricity Board (PSEB) has detected 8000 illegal power connections in some areas of the city including the Focal Point, Industrial Area, Tajpur Road and the Police Colony, Jamalpur. One lineman has also been suspended for collusion in facilitating the illegal power supply to these households. Deputy Commissioner Anurag Verma has asked the SSP, Ludhiana, to register a case against seed dealer Garg Seed Corporation of Sarabha Nagar here for allegedly fleecing farmers by selling spurious hybrid cotton seed. Residents of nearly four villages falling under the Raikot sub-division have resented the shifting of the Jhordan branch of the Central Cooperative Bank to Nathowal village, which is situated at a considerable distance from Jhordan. A campaign launched by the Joint Action Committee of Punjab Agricultural University (PAU) for the past several months against the Vice- Chancellor, Dr K.S. Aulakh, has been finding little acceptance in the university and among PAU Teachers Association (PAUTA) members. Even after two months the police has no clue about the burglars who had broken into a bank at Latala village and attempted to loot cash by breaking open cash chest with gas cutters. Interrogation of prsons allegedly involved in robbing banks and nabbed by the Ludhiana Police bore no fruit. 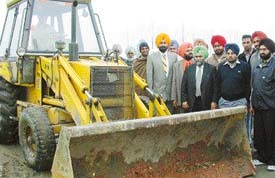 Mr Malkiat Singh Dakha, MLA and former minister, Punjab, said today that in the Dakha Assembly segment, development projects of Rs 7 crore have been taken up during the last three years. These included widening of roads and pavement of PC on link rural roads, construction of bridges over Budha Nullah, laying of sewerage and water supply in the urban area. Mr Sarwan Singh Boparai was today declared new president of the Punjab Agricultural University Students Association (PAUSA). Khushwant Singh quit the post following completion of his degree. They pedals all day to help commuters reach their destinations but they are often viewed as the ones causing traffic congestion in the city. They are rickshaw-pullers who lead a tough life to earn their livelihood. Rajgarh village, that served as a major alternative route for the toll evaders at Doraha has been reduced to a virtual hell as there is no respite for this ‘doomed’ village from the heavy vehicular traffic pouring in day after night and night after day. 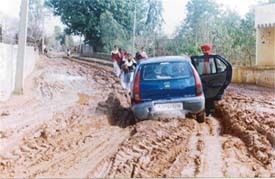 A car stuck up in the muddy road at Rajgarh village. Body of Inderjit Singh, a BSF jawan of nearby Sudhar village who had died along with five others when an avalanche had hit their post near Line of Control in the Kupwara sector on February 11, was cremated with state honours at his native village today afternoon. Besides personnel from the BSF the district administration and the police officials paid tributes to the brave jawan. 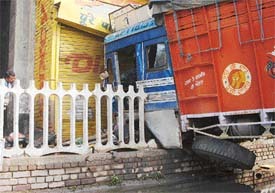 The birthplace of Punjab Kesari Lajpat Rai, with a population of one lakh, has become the victim of indifferent attitude of various departments, including the local Municipal Council, Market Committee and PWD, resulting in lack of basic amenities like proper roads, drainage and sewerage system, etc. Sound pollution by loudspeakers, hosiery and sewing machines, generators and microphones in residential areas and silent zones is not only a major nuisance but also causes discomfort to the city residents. “The PSEB, while submitting its annual revenue report for 2005-06 to the Punjab State Electricity Regulatory Commission, has recommended an additional clause of fixed charges per kilowatt of the sanctioned load per month for all categories of consumers. The Viklang Sahayata Kendra (VSK), of the Bhartiya Vikas Parishad here has provided a pair of calipers to 19-year-old physically challenged Pritpal free of cost. Some thieves had stolen goods worth Rs 1.50 lakh from two shops yesterday. A clerk with a public school near Mundia village was today booked by the city police for cheating a number of school students by not depositing their examination fee for Middle and Matric examination. A managing director with a knitwear firm was booked today on charges of cheating the firm of over Rs 6.42 lakh, which he took from different parties but did not deposit it in the firm’s account. Traders and industrialists suggested to amend some provisions of VAT with their consultation during a seminar on VAT - 2005 organised at A.S. College Khanna. Taxation expert and writer P.C. Garg, Advocate, was the main speaker. Students of class XI of Sacred Heart Senior Secondary School, BRS Nagar organised a get together here yesterday for the outgoing seniors. If you dreamt of making films and thought your dream would never be realised for want of funds, there is a ray of hope for you. The British Council has come forward to promote thought-provoking, low-budget digital films of duration as short as even 10 seconds. The three-day 10th Indian Congress on Bronchology (Broncocon 2005) organised at New Delhi during last week, jointly by the Indian Academy of Bronchology and a Hospital, dwelt upon a number of new diagnostic techniques for treating bronchitis. The staff students, and faculty members of the Dayanand Medical College and Hospital and its sister institution, the Hero DMC Heart Institute have come out in support of the proposed move by the managing committee to seek a permanent police post in the vicinity of the hospital premises. Sukhwinder Kaur, a BA I student, won as many as five titles in the track and field events on the opening day of the 62nd annual athletics meet of the Government College for Women here today. 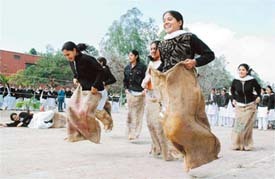 Girls participate in sack race on the opening day of the 62nd annual athletics meet of Government College for Women in Ludhiana on Wednesday. 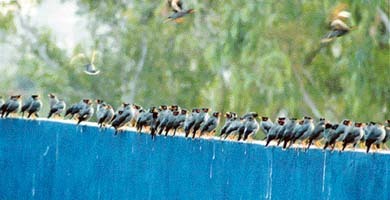 The 39th annual athletics meet of Punjab Agricultural University, which was scheduled to begin tomorrow, has been postponed, as the track has not been found fit for use due to rains. The Municipal Council, Khanna restored the water supply to jaundice-affected areas of the town yesterday after a gap of one week.